Learn here how to manage and export the history of requests from Microsoft Graph Explorer. Microsoft Graph Explorer is a tool used for accessing the objects and properties across Office 365 services by passing Microsoft Graph APIs. Microsoft Graph API returns the response from different Office 365 cloud services with a single endpoint with different parameters. Based on the Microsoft Graph API request, the tool authenticates based on the user login and returns the response. We can try n number of requests with this tool if we need the response after some time. Now, the tool enables us to get the response from history without running the request once again. To export the JSON response from an older request, follow the below steps. Click the "Show more" link under History from the left side panel of Graph Explorer. The link opens the "History" panel. The History panel lists out the previous requests with the information, such as Request Method, Query, Date, Statues Code, Duration and Action. When hovering on each request, you can get the delete icon to remove the request from the history. Click on the "Export" link on the request. The particular request’s response gets downloaded as a HAR file in JSON format. The History panel also supports removing the older requests. Click on the "Remove All" button to remove the entire previous responses from the history. It looks cool, doesn’t it? 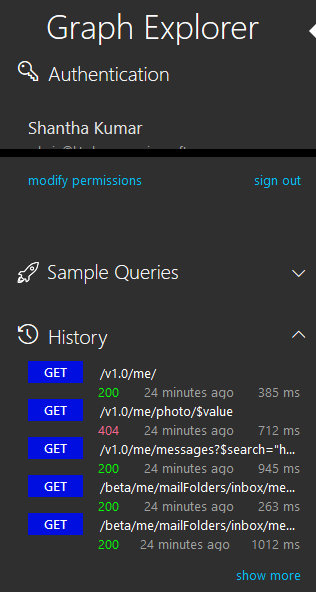 Try this history feature in Microsoft Graph Explorer. It really saves us time in rerunning our requests.